It’s beginning to look as if the naysayers are right about Mark Shuttleworth’s hopes to raise $32 million to produce about 40,000 Ubuntu Edge devices. It ain’t going to happen, unless he manages to pull another rabbit out of the hat. Right now, his Indiegogo campaign is stalled at a little over $7 million, where it’s been for several days. I’m not going to go into the details that led to this, we’ve covered that already, but it’s beginning to look like the Ubuntu Edge happy train is running out of steam, especially since about half of the money raised came in the first day or two of a campaign that’s now in day nine. Even if Shuttleworth misses his stated goal, however, he’s still going to show the ability to raise a substantial amount of cash. Indeed, the $7.3 million already raised isn’t chopped liver, as the expression goes, and unless this campaign is already completely spent, which I doubt, he stands to raise somewhere between $15 and $20 million by the time the curtain falls at Indiegogo. If he does some tinkering, which I imagine he will by offering another incentive or two, he might even get the finishing number up into the mid-twenties. Let’s say the campaign comes in at $20 million, $12 million short of goal. What does Shuttleworth do? Because this is what Indiegogo calls a “fixed funding campaign,” if he falls short of his goal at all, then all contributions are returned. This would seem to indicate that not achieving the goal after the $20 million mark is met, might possibly kinda sorta be something that maybe won’t happen. In case you don’t get it already, I’m not sure about that last thought. I’m just kinda sorta speculating out loud. Shuttleworth’s got a lot riding on this. It certainly looks like the Ubuntu Edge is a make or break moment for Canonical as a GNU/Linux distro developer. There’s plenty of reasons to suspect that if the Edge doesn’t get some traction, then Shuttleworth will either shutter Canonical or turn it into something else. According to an article published last summer by Forbes, Shuttleworth has an estimated worth of $500 million–or did when the article was written. This means that $12 million is merely chump change, mad money to be hidden in a wallet in case a wild hair gets stuck somewhere. He could easily have some discrete “donations” made to push the Indiegogo campaign over it’s goal, announce the fundraiser to be an overwhelming success and go about the business of manufacturing his product, the Ubuntu Edge. Why would he do this? For the same reason he’s turned the introduction of the Ubuntu Edge into a three ringed circus from the start. It would be another PR ploy for the benefit of the likes of Samsung, HTC, Dell, HP or any other equipment maker looking to latch on to “the next big thing” and bring it to market. Do you think, with the memory of the WebOS fiasco still lingering in their institutional memory, that HP might sit up and take notice if Canonical can raise $32 million selling a way overpriced desktop handset to millions of people who are essentially buying blind, completely on spec? Do you think that Michael Dell, who’s got to be worried about betting the back forty on the XPS 10 tablet running Windows RT, might see possibilities–especially if the new Ubuntu Edge owners start reporting that the device works as well if not better than advertised? I know what you’re thinking. You’re thinking it would be unethical for Shuttleworth to donate to his own campaign to inflate the perceived demand for the Ubuntu Edge. That would’ve probably been true back in the 20th century, but ethical lines in 21st century capitalism seem to have become somewhat blurred. As long as he doesn’t play any games with the tax people on this, the folks who officially decide ethical issues in our culture these days will be perfectly happy. You and I might have a question or two to ask, but we’re the trees falling in the forest when there’s no one around to hear. Besides, ethics might not come into play here at all. If the device is really cool and works really well, if it’s liked by everyone who bought one and envied by all of their friends, then it would be a no-brainer for HTC, Dell or maybe Nokia to board and ride the bandwagon–especially since by this time mainstream media and the blogosphere will be busy creating free demand for the product. Even Perez Hilton will have something to say by that time. This is all just speculation. 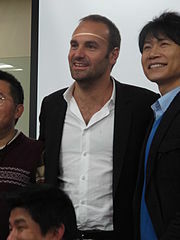 In 22 days, Mark Shuttleworth may very well look at the numbers and mutter something about “$25 million just not being enough” and walk off into the sunset to to leave the Ubuntu Edge and Ubuntu Linux behind forever. 37 comments to What If Ubuntu Edge Misses Fundraising Goal? Not for nothing…but lets not forget that whatever monies Shuttleworth DOESN’T raise with the crowdfunding, hew can more than make up for with his OWN money!….Either way Ubuntu WILL make their goal!..and I can’t WAIT!….LOL! I guess you’re clearly wrong here to speculate on another’s character without knowing his stance on the subject. From Reddit AMA. “Hello Mark. Thanks for doing this AMA. To be honest, I hope it doesn’t make it. This device is nothing more than a gimmick. What corporation would adopt it, when they don’t discuss encryption or security controls at all? Who in the community is going to adopt it (outside of the fanbois base) when Canonical is the worst FOSS company that has ever existed in terms of mindshare and upstream contribution? What consumer wants a device that changes user experience based on how its connected? I know that I wouldn’t want that, and I don’t know anyone who would. Consumers already struggle to learn new interfaces when new devices / operating systems are released – multiplying that by two is a recipe for disaster. This is a device that is creating a problem to solve, not solving a problem that actually exists. The device isn’t any more portable than a laptop, because you still have to have docks with monitors and keyboards scattered everywhere to use it. So it fits in your pocket, who cares if you can’t take it to Starbucks without lugging a monitor and keyboard too. It’s the proverbial Commodore 128-D of phones. Andrew, a troll it seems, sounds like someone that has something to lose and talking out his bumm. The majority of corporations are BYOD these days, providing subsidized Android devices and Chromebooks prove this. Google, Apple and even M$ could build something like this. What Mark is trying to do is lead by innovation, by showing how powerful smartphones are these days. yes you need a monitor and keyboard, but thats when your at your desk for your job. One does not need a large computer or laptop to do IT these days and this technology could even be integrated into 7 / 10″ tablets. Do note that when the device is removed from the dock, it reverts to Android. > Andrew, a troll it seems, sounds like someone that has something to lose and talking out his bumm. Actually I’m not a troll, and I don’t have anything to gain or lose. I’m just looking at it objectively – I’m sorry that you can’t handle that. Throwing the troll card out there doesn’t help your argument, in fact it weakens it significantly. > The majority of corporations are BYOD these days, providing subsidized Android devices and Chromebooks prove this. Link to statistics please. FYI – Android devices support encryption, remote wipe, and everything necessary to function in an enterprise setting. > Google, Apple and even M$ could build something like this. What Mark is trying to do is lead by innovation, by showing how powerful smartphones are these days. yes you need a monitor and keyboard, but thats when your at your desk for your job. They don’t because there isn’t a market for it which was my point. Motorola tried it, and they failed. Mark isn’t leading by innovation in this case because there aren’t any innovations here. > One does not need a large computer or laptop to do IT these days and this technology could even be integrated into 7 / 10″ tablets. This is role specific, but in some (limited) cases you are right. In these limited examples, it can be done with a tablet – you have made my point for me. In many other cases a laptop or a desktop is still a necessity. All IT positions are not equal. > Do note that when the device is removed from the dock, it reverts to Android. Hence two interfaces, like I said. My understanding is that when the Edge is removed from the dock, it reverts either to Android or to the Ubuntu mobile interface. We deal with two or more interfaces everyday when we go back and forth between our smartphones, tablets and laptops. When the device is docked and you’re sitting at a keyboard and large monitor, you’re at a desktop for all intents and purposes. Unplug and go, and you’re holding a handset. I don’t think this will be such a problem. I don’t think I would want such a device, either, Andrew, but I think this might catch on with the public. And who knows, I might want one when I see it in action. When the rumors first started flying that Apple was coming out with a tablet, I was convinced that would be the last thing I’d ever want to own. Now, I would really like to be able to afford something like a Nexus 7. As the Lion says in the commercial – that’s my two cents. Such a melodramatic article! It’s OK if you don’t like the device or you don’t want it to be a success, but here you have speculated as much as saying Ubuntu won’t exist. Do you have any idea what this sort of a OS means? It’ OK to be jealous of Mark given that you have no market value at all when compared to his :). And the way your thought show – you will remain that way. Overpriced? Then what do you think of iPhone? Do you have any idea what form factor means? > We deal with two or more interfaces everyday when we go back and forth between our smartphones, tablets and laptops. When the device is docked and you’re sitting at a keyboard and large monitor, you’re at a desktop for all intents and purposes. Unplug and go, and you’re holding a handset. I don’t think this will be such a problem. That’s a fair point, we do deal with two or more interfaces every day but we don’t do that with the same device. When I take a laptop or a tablet or a phone home, no matter what I connect the device too the interface remains consistent. For example, when I connect my tablet or phone to my bluetooth keyboard, the interface doesn’t change. I think seeing it in action would probably make me want it less, especially after watching the video when the campaign was announced. Maybe my use-case is abnormal but I use different tools for different tasks. I don’t use a screwdriver as a hammer, or a hammer as a screwdriver. A leatherman is a fine set of pliers but I can’t see it being a useful drill. I use a laptop for compute resource intensive tasks; a phone for calls, messaging, or a quick game; and a tablet for reading, surfing, and gaming. An Ubuntu branded leatherman phone doesn’t provide any value over my existing leatherman phone (Galaxy S3) which already satisfies my needs perfectly. Maybe it will for someone, but I suspect it would be an insignificant number. Wow terrible article from someone who obviously knows nothing about Ubuntu or Canonical. “It certainly looks like the Ubuntu Edge is a make or break moment for Canonical as a GNU/Linux distro developer.” Really? Do you know anything about Ubuntu? Its been one of the top two most widely used distros for years and has over 20 million users. I doubt it is going to vanish because of a phone. Ubuntu is a nonentity. The fact this tiny project’s trouble raising tiny dollars gets so much attention says more about Linux than Linux wants to know. I am confident Mark will succeed. Will Canonical go broke? Of course not, and I don’t think that’s the point Christine Hall is making here. Canonical/Ubuntu has been systematically distancing itself from FOSS for years, whether it’s dropping “Linux” from the Ubuntu site or developing parallel software like Unity or Mir. So it’s completely plausible that, given the scenario that Ubuntu Edge isn’t publicly funded, Shuttleworth could either wash his hands of FOSS and sell Canonical, or take a page (or pages) from Apple’s and Microsoft’s playbook and take Canonical on its own closed way (i.e., “turn it into something else”). Alarm bells started ringing for me over Canonical prior to the Unity debacle. I stopped using Ubuntu because of the insufferably smug, patronising attitude that was starting to pervade everything. Since then I have seen nothing but more reasons to be glad I left when I did. I hope the phone thing works, for no other reason than it would be good see some competition for Android/iOS. However- it’s a given that periodically Canonical will decide to change something on the phone, without consulting customers. People who complain will be sneered at. The fact that such changes will be less than completely pretested, leading to service loss and function failure, is also a given (look at how they treat their Ubuntu users). He’s also missed a golden opportunity to assure customers that unlike all the other mobile phones out there, “ours doesn’t spy on you”. Perhaps it already contains the spyware. Either way – I don’t trust Canonical – they have shown, time and again, that they cannot be relied on. And if you want a disastrous sales pitch, then you need go no further than “why is your phpone so expensive? because it has free software on it”. Well if He or a retailer / reseller, partner or whatever wants to buy the remaining, then why not ? He can than sell those once available to people whom may had missed the campaign or didn’t had the $ at the time to do so. I’ve seen plenty of different campaigns get a Huge push at the last days / hours from different sources. I think they need to make this possible. Mark is not a quitter and that’s something I admire. >For example, when I connect my tablet or phone to my bluetooth keyboard, the interface doesn’t change. You’re not following the development of this OS. They have already mentioned that it will be very flexible for any type of user or hardware scenario. If you want the same interface, then you will be able to override this in the options. If you need to use an app that works better in another interface then no problem, you can get that too. Unlike windows8 that wants to give you a tablet interface on all laptops (even those without touch screen), ubuntu wants to do this better and give you the best interface for your needs and/or hardware combination, of course all of them looking and behaving very similar to avoid confusions, but optimized for each device. @Larry parallel software? May I remind you that all of the GNU was developed in parallel? May I remind you that OpenStack was developed when Eucalyptus already existed and was open source. May I remind you that GNOME was developed when KDE already existed (and tons of other DEs). Xorg was a fork of Xfree86. Systemd was developed when upstart was in production for years already. Chromium was developed when Firefox was already established in the market. So, wtf are you talking about? Is Mir or Unity closed source? It’s just f… politics from major players that still want to lead, and people smoking that crack without thinking. Don’t like? Don’t use it. There’s tons of GNU software you don’t like nor use, so why aren’t you bashing those? I’ll tell you why – it’s stupid to do that. Think about it. Sans Canonical going down, I think this is a very good article. It’s just a phone guys. Mark is trying to go uphill – as in sell to the same adopters whom he brushed off during the Unity debacle. There is no new compelling functionality for the end user. The market won’t go for that. He won’t make the 32 mil goal the way it is going. Even if he does, the world does not change – it will be a nice little piece of technology summarily forgotten by most users swimming against high phone fees. That’s the pain I am guessing many want taken away. In other words, a smart phone with a $35 monthly wins over the edge at $50. Have any of you made more money or changed the world because of your smart phone? (2) Why hasn’t Oracle purchased Red Hat? They bought Sun!!! > You’re not following the development of this OS. I’m following it more closely than you might realize. > If you want the same interface, then you will be able to override this in the options. It shouldn’t even BE an option. > Unlike windows8 that wants to give you a tablet interface on all laptops (even those without touch screen), ubuntu wants to do this better and give you the best interface for your needs and/or hardware combination, of course all of them looking and behaving very similar to avoid confusions, but optimized for each device. I haven’t compared it to Windows 8. Windows 8 is a huge UI experience failure in itself. It makes the same mistakes that Edge is making in that it offers two different user experiences. There is a desktop mode and a metro native mode and it’s app based. .. and it’s garbage too evidenced by the increased decline in the PC market. The 7 million came from all the guys at OMG who sold the there homes and all assets for this. There is nothing left for those guys to sell…LOL! >It shouldn’t even BE an option. That’s all phablet apps are: “Apps in fullscreen”. I didn’t say that I didn’t like options, nor did I imply it. There are good options and bad options – that is not a good option and it shouldn’t be something users have to learn to do. You’ve obviously never used anything like touchwiz, my calculator doesn’t use the whole screen on my tablet. @Larry I see your point, but I don’t see how this is any way tied into the Ubuntu Edge, a crowd-sourced project that is costing nothing to Canonical if it isn’t followed through. If anything, the publicity alone will help Canonical. This will no doubt continue to happen, but I don’t see in any way how the Edge is a “make or break” moment for the company. They are already moving to tablets and other platforms, as well as more specified products like Ubuntu Business and Ubuntu Studio. Sorry but am not a fanboy, I would’t get anything useful out of it. Am also an android user and am talking from personal experience. I even own one of those Mini-android PCs (like the MK808 or MK802III) that you hook up to a monitor or a TV + add mouse and Keyboard. But is many times horrible to use on that hardware combination. Android has no windowing system and sometimes I just wanted to bang my head. Phablets are more for consumption than for production/real multitasking like a desktop OS. Anyway I hope am not the one feeding a hater, else Am getting off the ride here too. Windows 8 is failing precisely because the ARE keeping the interfaces the same everywhere. You now have a 23″ monitor, with the same interface as your 4″ screen – a bunch of tiles. REALLY stupid. And Canonical is trying to take linux into the future with more touch screens, whereas Gnome is stuck in the past. KDE does have a more touch friendly UI, but Linux UI needed the radical redesign Unity brought for touch screens. I am not an Ubuntu user, but I did buy the Ubuntu Edge. I used unity on my netbook for a while, and my biggest gripe with it was that the File Manager was closer to Gnome style than KDE style. I am a KDE user. It seems to me that the article and some of the comments here are missing the mark. Firstly, this will be a fully functional android phone built upon the best available technology. There will be no other phone like it on the market, but if you compare the full price of the latest iPhone (sans contract), the Edge is definitely not overpriced (though for late funders, it may be). Then again, the device will also be a fully functioning computer. Whether or not the OS is completely to your liking, that isn’t a bad add-on. If you happen to be a web developer like myself, having an ultra-portable development platform is a very big bonus. Whether or not the device is overly converged is a moot point to me because I already have 3 different docks and numerous blue-tooth devices for my current android phone. The one major negative that I’d concede is that Canonical is already starting to compromise the user experience by pre-loading bloatware (i.e. – Lastpass). I see Canonical potentially forging a path to a very negative user experience as they make more and more compromises to make their funding goal. Still, I am only speculating as to the final product.